If you crave a taste of the tropics in the North, try growing hardy hibiscus plants. They often produce flowers of a size rare for plants that can survive cold winters. 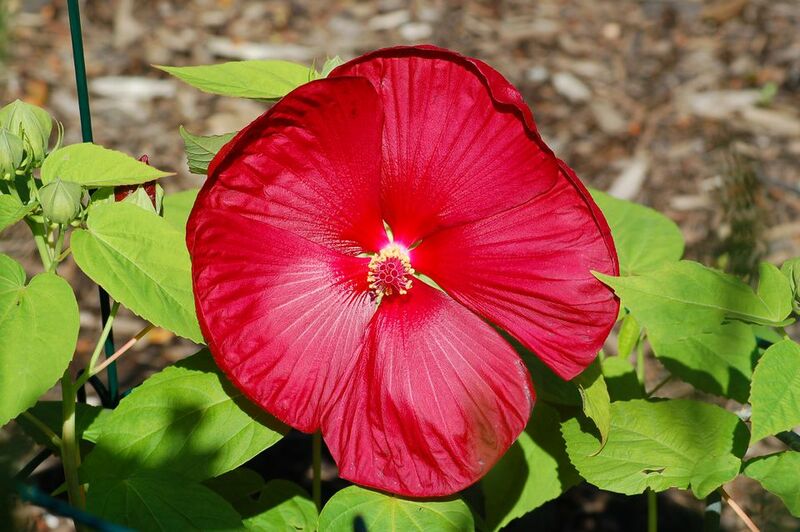 Perennials that serve as excellent foundation planting, hibiscus are a colorful addition to a garden. They can be planted in spring or fall (as long as there is no risk of frost) and grow quickly. The showy flowers—often referred to as "dinner plate hibiscus"—feature tissue-thin, ruffled petals in blues, pinks, reds, and whites. However, they're better suited to the landscape than to being cut and placed in a vase, where they'll last only a day or so. Plant taxonomy classifies the hardy hibiscus plants as Hibiscus moscheutos. They also go by such common names as "rose mallows" and "swamp mallows." Hardy hibiscus are a cold hardy plant despite bearing large blooms that call to mind the tropics. The hues of the most common cultivars are white, bicolored, or various shades of red or pink, but other colors are now available. Although hardy hibiscus plants seem woody in summer and function as sub-shrubs in the landscape, their stems do die back to the ground in winter, making them herbaceous perennials, technically. Some of the most popular hardy hibiscus cultivars reach about four feet in height, with a spread slightly less than that, but the bloom size can be up to 10 inches. Even cultivars with smaller blooms still produce impressive, saucer-size flowers. While each bloom lives only a day or two, they are quickly replaced by newcomers. The species plant is indigenous to eastern North America. H. moscheutos cultivars can be grown in USDA plant hardiness zones 4 to 9. For your hardy hibiscus plant to bloom to its greatest potential, it needs about six hours a day of full sun. However, if you live in a hot and dry zone you should provide your hardy hibiscus occasional relief from the bright afternoon sun. Shade from other leafy plants placed nearby should help. Indoor hibiscus plants should be situated near a sunny (southwest facing) window and if that still doesn't provide enough light, you can augment with artificial lighting. The species plant is a wetland plant, and hardy hibiscus flowers can be treated as plants for wet soils. So if your landscaping situation is a soggy area where most plants do not grow well, H. moscheutos might be the answer. This makes them useful around water features. If you are not planting hardy hibiscus plants in a wet spot, make sure they are adequately watered—but don't overdo it. A small plant with fewer leaves needs less water than a large leafy plant. In warm weather, you need to water your hibiscus plant daily but in the winter you should water it only when the soil is dry to the touch. Hibiscus flower best in the 60 to 90 F range. Bring plants indoors before temperatures dip to 32 degrees, but be mindful that low humidity can dry them out. Mist the leaves daily or place each pot on a tray with a layer of gravel underneath. Add water up to the top of the gravel and as it evaporates, humidity will rise around the plants. A humidifier may also help. Growing hibiscus plants need plenty of nutrients. Use either slow-release or water-soluble fertilizer but make sure the nutrients are balanced. For example, use a 20-20-20 or 10-10-10 fertilizer. You can use a diluted liquid fertilizer once a week, or a slow-release fertilizer four times a year: early spring; after the first round of blooming; mid-summer; and early winter. Repot in late winter and use houseplant potting soil or a soilless mixture. Your hibiscus can wait two to three years to be moved into a larger pot. Just remember to use one with good drainage. The best way to propagate hibiscus is through stem cuttings. In spring or early summer, cut a section of new growth or softwood about 4 to 6 inches long. Remove any flowers or flower buds from the node area. Pour a little rooting hormone into a shallow dish, moisten the cut end of the stem and dip it in the powder. Use your finger to drill a hole in moist growing mix, ensuring it is wide enough that the rooting hormone won't rub off when you place the cutting in the hole. Tamp down the soil around the cutting. Water the cutting, cover it with a plastic bag and place it in a warm spot, 60 F or higher, out of direct sunlight. New leaves should appear 8 weeks later; once the cutting is rooted you can move it to a larger pot. Since this perennial dies back to ground level in winter, you can prune it down to the ground in fall. As alive as the branches may seem in fall, they will die in winter. But the root system will live on and new branches will spring out of the ground the following year. If you are growing hibiscus in a container, be sure to plant it in a pot with adequate drainage holes. Over-saturation of the roots will cause them to rot.